As part of a complete metal stairs and work platform system, ErectaStep metal handrails provide critical fall protection for your workers. Not only are they lightweight and easy to install, but they’re also precision built using 2″, high-grade aluminum tubing that won’t rust. And each handrail section is powder-coated in ANSI yellow for extra durability and longer service life. Because ErectaStep handrails are pre-engineered, in-stock and ready to ship, you’ll get your safety project completed a lot sooner, which means you can get back to business a lot sooner. Custom-fabricated systems, on the other hand, can take weeks to make and install. Our products ship fast and install even faster. And no matter what your access problem, ErectaStep has the solution. Universal Design for Added Versatility. Our metal handrails come in one standardized size and share a bolt hole pattern with the 36" square universal platform, which means the handrails can be easily attached to any side of the platform. The handrails also share similar bolt hole patterns with our stairs, allowing you to create safe stair systems quickly and easily. Lightweight, Yet Durable Construction. The metal handrails are built with heavy-duty aluminum and provide a design load that's 200 pounds in any direction. The round pipe has an outer diameter of nearly 2", which helps to ensure the handrails handle years and years of wear and tear. The product is powder-coated in ANSI safety yellow for a safe and durable finish. Quick Delivery and Simple Installation. Our innovative manufacturing process standardizes many of our components, allowing us to keep our metal handrails in stock and ready to ship. So you can get your OSHA-compliant safety system up and running long before the welding would even begin with a custom-fabricated system. And installation takes no more than a few hours and requires littel more than a wrench. It all adds up to whole lot less downtime. Traditionally, aluminum handrails have been fabricated one at a time. ErectaStep makes use of a high-tech laser manufacturing process, which produces a higher quality, more precise product than those created through custom fabrication. Ordering additional or replacement handrails is always quick and easy, and you get the same high-quality product every time. As part of ErectaStep's five-component modular crossover system, your metal handrails can ship out to you the day after you order. All you need is the measurements of your workspace—we’ll walk you through the rest. Contact one of our experienced team members today to discuss your operation's needs. Learn how each of the five components of ErectaStep's aluminum stair and work platform systems improve productivity for your business. Ready to Assemble. Using just five components, the modular design can be quickly assembled and requires no fabrication. You will receive all of the instructions and even the wrench for bolting. Reusable. 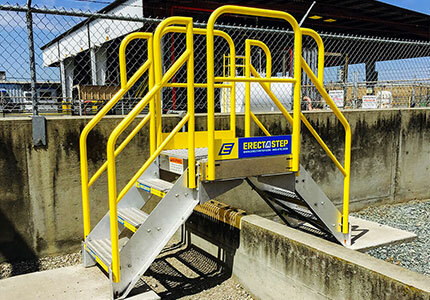 ErectaStep industrial platform and stair systems are easily moved and reconfigured into unlimited, expandable safety solutions. Shorter Lead Times. Because of the standardized components and high-tech manufacturing process, ErectaStep can deliver products to you quicker than ever before — so you can get it up and running faster than ever before. Always Safe. OSHA compliance is built into every one of ErectaStep's products, lowering your risk of ownership, increasing your productivity and helping you make safety a priority. Long Life of Service. Precision manufactured out of powder-coated aluminum, ErectaStep stairs and platform systems are durable and long lasting, which means less maintenance costs over time. In Stock and Ready to Ship. 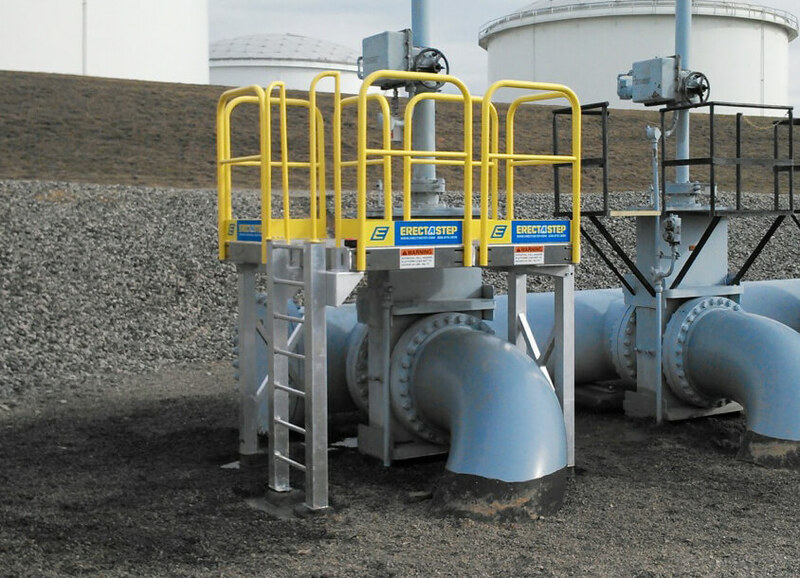 ErectaStep's patented configuration app lets you design your platform systems in real time. Call A SafeRack representative about your specific requirements and we’ll ship out your system as soon as tomorrow. Aluminum Handrails can be made in any size required. Delivered in a sufficient timeframe. Overall the product is durable and exceeds in performance. Installation was simple. Product was delivered within 2 weeks. There were three different orders and one was during the holidays. All were delivered in a sufficient timeframe.